The lifter needs a spotter to hold the board or boards on his chest. The lifter should set up as usual when performing the bench press exercise. The grip on the barbell should be about 3 inches narrower than the normal shoulder width grip. The barbell is taken with arms extended and lowered to the board in a controlled manner. It is important and safe to lower the weight under control. When the barbell touches the board, pause for a split second and then press the barbell to lockout. So why perform board presses? Everyone has a spot in their bench press movement where heavy weight just seems to stall. Mine is about half way through the movement before locking out. Performing board presses can eliminate this area of weakness in your bench press range of motion. Board presses also will make the back of your upper arm the triceps strong and grow like crazy!! A lifter when doing board presses can actually use heavier weight than when doing a full bench press. Board presses strengthens the muscles in the range of motion of the board press which effectively eliminates any weaker areas of the bench press. Also those who have been looking to increase their individual bench press have discovered by training the bench press movement in smaller increments that faster gains can be attained!! Board presses builds huge power from the midrange of the press to lockout. Board presses are the best way to build power. 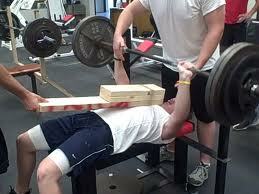 I here a lot that rack presses or pin presses do the same thing as board press. In my opinion the answer is no. When you take the bar downward onto the pins the bar stops completely. With the boards you take the bar down and as they touch the boards it still sinks in a bit into your chest. Board presses you have constant tension as the rack or pin presses are not. So with that said, if you are looking for bigger arms, bigger triceps and or increase your bench press board presses are the way to go!! !